Most people are not aware that there is a difference between vellum and parchment – both being animal skin (not pretend ‘parchment’ paper). 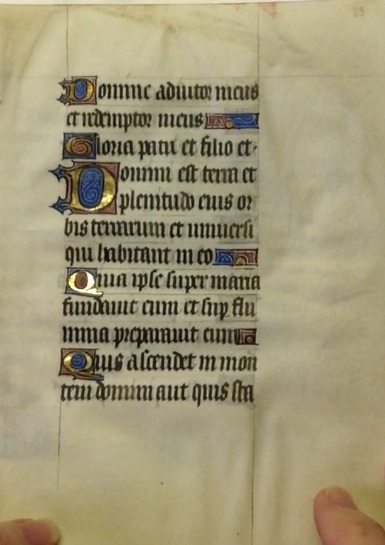 The names of skins are often used interchangeably and it can be quite difficult when looking at mediæval manuscripts to determine whether the substrate is vellum or parchment. The clue is often the crispness of the letter-forms, but if a sharpened quill is not used in the first place, then this can be even more challenging! I prefer the terms that the makers of vellum and parchment use and so regard vellum as calfskin; it is a dream surface to work on when prepared properly. 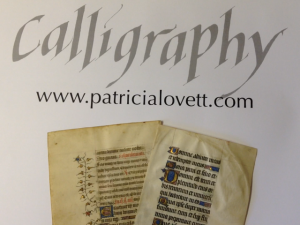 Parchment is sheepskin and, in many people’s opinion, is inferior to vellum for calligraphy. 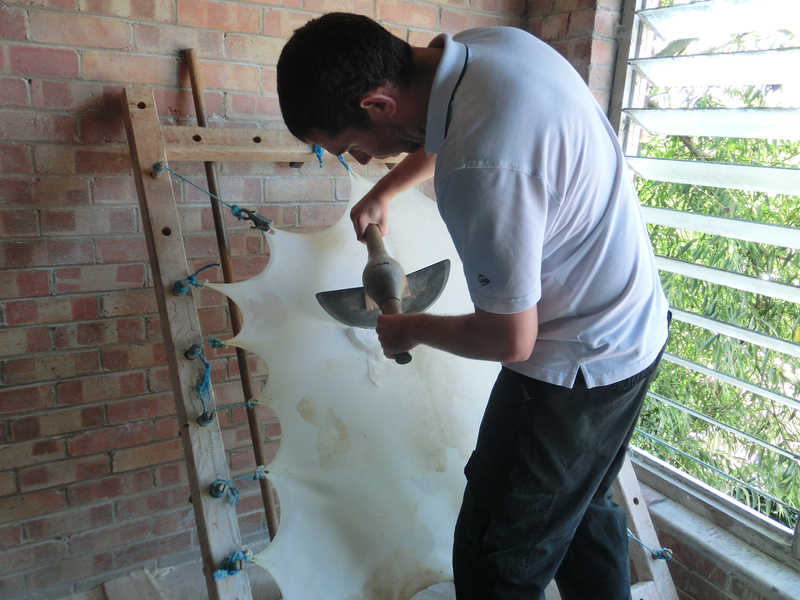 Goatskin can also be used but its surface is often very bumpy. The skins are a by-product of the meat industry, and as far more skins are produced than can be used by the leatherworkers, many skins end up in land fill. 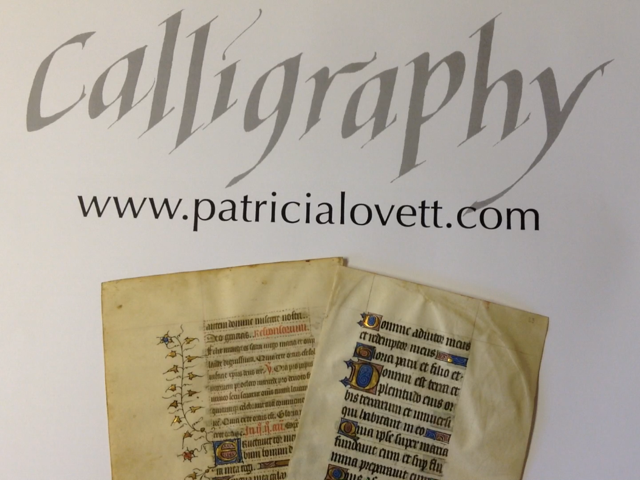 To see more about vellum and parchment and the qualities of the skin, what to look for, types of skins and the best to use, see my Calligraphy Clip, vellum and parchment. Skins for both parchment and vellum are selected carefully, washed and soaked in lime to slightly swell the hair follicles so that the hair can be removed more easily. The skins are washed again and then stretched out on a ‘frame’ or ‘herse’. Whilst on the frames they are kept under constant tension and scraped with a semi-circular razor-sharp knife. Lee Mapley of William Cowley Parchment Works, finalist in the Craft Skills Awards, is shown on the right; he produces skins of excellent quality. The skins are then allowed to dry and when ready, cut from the frames and rolled, stored and then sent out. ******SPECIAL OFFER!! Three pieces of skin for £12 (+ p+p), usually £16 (+p+p). 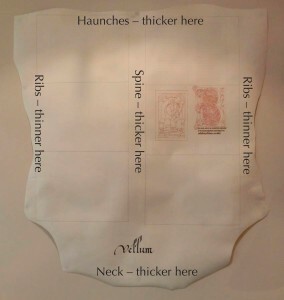 I always use skins from William Cowley, the only parchment and vellum maker in the UK, and I highly recommend their products. They have kindly agreed to a special trial offer for subscribers to my newsletter. A whole skin is very expensive, so why not try manuscript calfskin vellum, classic vellum and sheepskin parchment (*see next but one paragraph). All three pieces are about 5 x 3 inches (approximately 13 x 8 cm) which will be big enough to write out a verse of a short poem, piece of prose or paint a mediæval miniature (and without the hole as in those shown here!). To get this offer, please email me at the address on my website. I will then give you a personal code and the website link to William Cowley. They will give details of payment and ask where to send the offer. This offer is available to all my subscribers, and William Cowley will advise on postage for non-UK addresses. Vellum skins are not the same thickness all over as is paper; this can be seen from the picture on the right. This was the skin that I produced for the British Library’s major Genius of Illumination exhibition. The haunches, spine and shoulders are thicker and the ribs thinner. Care must be taken when selecting the part of the skin to use as parts will move and buckle or cockle in heat or when damp. 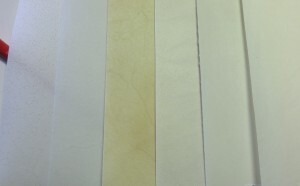 *There are also different types of vellum skin. Calfskin manuscript vellum is prepared on both sides and so can be used in books or where you want to use the back of the skin. 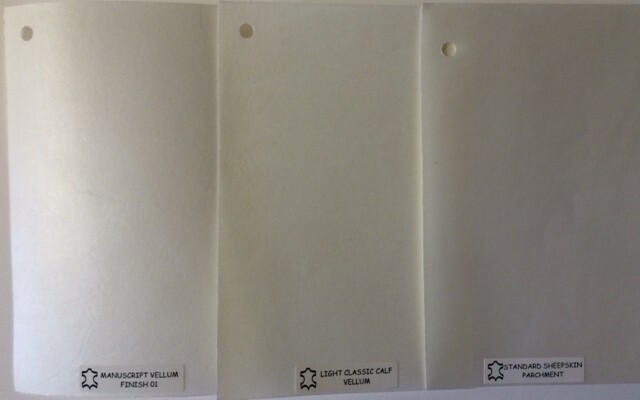 Classic vellum is bleached but prepared on only one side – useful if you want to create a broadsheet. 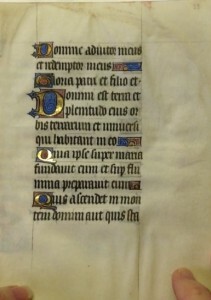 Natural vellum is not bleached, shows the character of the skin, and again prepared on only one side. Kelmscott vellum has a surface coating which makes it ideal for printing; it was made originally for William Morris’s Kelmscott Press. It’s good for painting, but you need to use a dry-ish mix of gouache to avoid lifting the special finish. Slunk vellum is from the skins of stillborn or uterine calves and is quite thin but still strong. You can see the thinness in the picture as the handle of the paintbrush shows through much more in the skin on the far left. 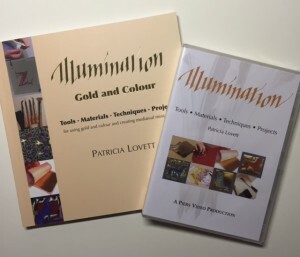 The skin needs to be prepared before use for writing and painting, and this information is in my book Illumination – Gold and Colour – and the accompanying (and stand alone) DVD Illumination, which is over 3 hours long. 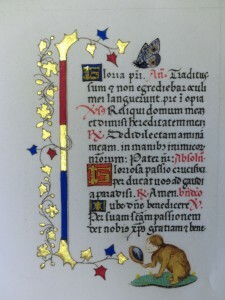 Both include how to stretch vellum over board to avoid it buckling and cockling and how to gild and paint a mediæval miniature in the traditional way. 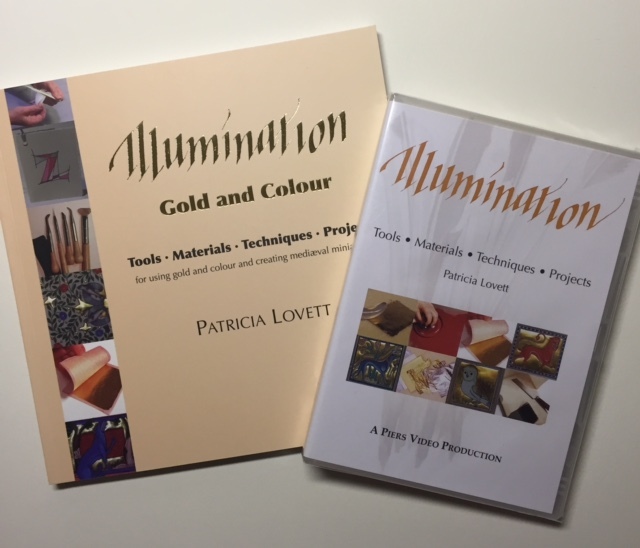 There’s lots of information about tools and materials for Illumination, as well as projects which are very simple to make. Vellum skin does, though, give the most wonderful surface for writing and painting, and if you’ve never tried it then you are missing a rare treat! 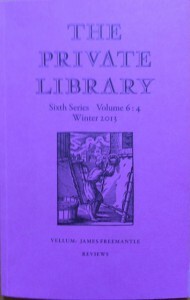 This entry was posted in Blog, Calligraphy and lettering, Manuscripts and tagged calfskin, goatskin, James Freemantle, Kelmscott vellum, lee mapley, parchment, sheepskin, slunk vellum, The Private Library, vellum, William Cowley Parchment Works on 16 June 2015 by Patricia.